Agatha Christie is one of my favorite writers. As a teen, I devoured her books: And Then There Were None is still the only novel I have read cover-to-cover in one sitting. I am devoted to Joan Hickson's portrayal of Miss Marple (the definitive one in my book) and to David Suchet's version of Hercule Poirot. Murder on the Orient Express was one of the books we had to read in middle school, making it among the easiest and most pleasurable of reading assignments. 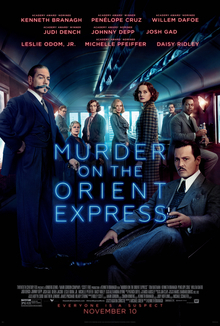 With this second theatrical version of Christie's novel (there being two television specials as well), this version of Murder on the Orient Express worked well, was mostly smooth and elegant, but not without its curiosities and eccentricities...not unlike Poirot himself. On holiday in Jerusalem, where he quickly solves a case at the Wailing Wall, Hercule Poirot (director Kenneth Branagh) is called to London on a case. To get there quickly, he needs to board the Orient Express in Istanbul. Quickly fitted in, he finds himself among a gathering of other passengers. Among them is the mysterious and villainous Edward Ratchett (Johnny Depp). Ratchett tries to get Poirot to be his bodyguard, an offer the Belgian declines. It's no surprise then when Ratchett is found murdered, an even number of stab wounds on him. Poirot, who tells the other passengers that he is probably the greatest detective in the world, now has a chance to solve the crime, as the Orient Express was caught in an avalanche and slightly derailed. At this point I'd like to offer that Hercule Poirot would never say he was 'probably' the greatest detective in the world. He'd flat-out say he WAS the greatest detective in the world. Yet I digress. Who among the various people could have murdered Ratchett? Was it his secretary, MacQueen (Josh Gad)? What about his manservant, Masterman (Derek Jacobi)? Was it the man-hungry widow, Mrs. Hubbard (Michelle Pfeiffer)? What about the famous Hungarian Count and/or Countess Andrenyi (Sergei Polunin and Lucy Boyton)? Could it be the haughty Russian Princess Dragomiroff (Judi Dench) or her maid, Fraulein Hildegard Schmidt (Olivia Coleman)? The seemingly meek Spanish missionary Pilar (Penelope Cruz) or the Hispanic businessman Marquez (Manuel Garcia-Rulfo)? The governess Mary Debenham (Daisy Ridley) or her secret paramour, Dr. Arbuthnot (Leslie Odom, Jr.)? Maybe even the conductor, Pierre Michel (Marwan Kenzari)? Then there's the fascist-sympathizing Austrian, Gerhard Hardman (Willem Dafoe)? It's a who's who in this whodunit, with Poirot running into seemingly all possible suspects, and the murder tied to a long-ago case, the abduction and murder of little Daisy Armstrong, daughter of a famous pilot in echoes of the Lindbergh kidnapping case. How does the Armstrong case tie into Ratchett's murder, and to each of the passengers? With the case solved, Poirot is asked to help investigate a death on the Nile (a suggestion that there may be a sequel, and that sequel being an adaptation of Death on the Nile, thought that could not be the murder in the original since that one happened when Poirot was there, not prior to). Far be it for me to spoil the mystery for those who haven't read the novel, but to its credit Murder on the Orient Express sticks close to the novel, at least in this particular point. On others, it seems to be like the train itself: slightly derailed, if not quite deranged. One thing that did surprise me is Branagh's decision to make Hercule Poirot almost a bit of an action star. The setting does make it hard to feature scenes outside the train, and to Branagh's credit he opened it a bit by having one interview outside and another in an open train coach, culminating in this revealing the criminal as the suspects. However, at one point there was a little bit of action injected that had our allegedly diminutive and older detective leaping about with gusto. I was pretty astonished that this Poirot was such an action lead. I was also slightly surprised that Branagh, along with screenwriter Michael Green, made Poirot and not the case the center of attention. This undercuts a lot of the characters, who sometimes just seem to pop in and out. The interviews of the Austrian Hardman, the Spaniard Pilar, and the American Marquez all were intercut, and it wasn't so much that you couldn't follow their various investigations so much as they were short-shifted given that others got more attention. The dynamics between them gets lost, and at times you wonder who are these people. Christie has been criticized for making the characters in her various novels one-dimensional, and there is validity in that criticism. I'd answer, however, that we don't need long explorations of characters who are not going to appear again, so interior lives won't get much attention in her crime novels. That being said, Murder on the Orient Express sometimes zips by the characters so quickly we don't get their connections to things, making it if not hard to solve the crime at least harder than it should be. It should not be a surprise given how many first-rate actors there are in Murder on the Orient Express that we get some good performances. It's here thought that we see how cutting off so much screentime for Branagh cost others a chance to show what they could do. Much has been made (and mocked) of Branagh's luxurious mustache. However, I think too much has been made on that mustache (though I would have thought that Poirot, vain that he was, would have dyed it). I'd say that Kenneth Branagh is, at 5'9", is too tall to play Poirot, who is closer in height to Jose Altuve (Altuve is listed at 5'6", but I think he's closer to 5'4"). Branagh's Poirot is a good version: courtly, intelligent, a firm sense of justice, though I'd say he didn't make him as fussy as I'd imagine Poirot to be. The Belgian accent (not French, we should note) works well and on the whole he gives a strong performance. A nice surprise is Depp, who remembered he could act. Who remembered he could act? As the villainous Ratchett, he was sleazy without being over-the-top evil, adopting a rough manner to his character. As I said, the nature of Murder on the Orient Express sometimes didn't allow for other actors, good actors, to do much (what kind of film gives Dench and Coleman essentially one quick scene together as the whole of their big moments). Pfeiffer to me was the one that went slightly over-the-top, though I cut her some slack in that her character was slightly over-the-top. One aspect to Murder on the Orient Express that was pleasantly surprising was the international nature of the multicultural cast. You had black, Arab and Hispanic performers where the characters were once Caucasian. Apart from Poirot's assertion that Dr. Arbuthnot had risen quite high for someone of his race (and this was not an insult, just an observation related to motives) and Hardman's quick request that he not be seated next to someone 'like him' (meaning Arbuthnot), race or ethnicity was not touched on. I enjoy that the film allowed for non-traditional casting while acknowledging that fact in a non-intrusive way. It didn't work so well for Cruz (the original character was Swedish), but since she wasn't given as good a role as she could have had, it was a double-loss. The main issue with Murder on the Orient Express is that the audience was not given the information it needed to solve the crime. Those who had read the novel or seen the original film (such as myself) didn't need that much information, but for those who hadn't, I think it robbed them of a chance to do their own sleuthing. One character, Bouc (Tom Bateman) ostensibly there to aid Poirot in his investigation, might just as well not even appeared. Still, for its elegance (if nothing else, the film has a certain panache) and as mild diversion, Murder on the Orient Express is not a bad two hour's worth. Haha, I didn't remember that Johnny Depp could act! That was unexpected. Good point about there not being enough info for the audience to figure it out. Though for me, knowing the end, I was more interested in Poirot's character anyway. Both would've been ideal. They could've cut some of that unnecessary action bits to make room. I think you've hit on something: MOTOE was more about Poirot than about the mystery itself. That's all well & good, but as much as I love Poirot, I'm not looking for an Hercule Poirot Extended Universe (though I've always thought a film version of Murder on the Links or Murder of Roger Ackroyd would be treats).